Ready for an adventure with cables and lace and color? The Escondido Falls Shawl is a wedge-shaped shawl worked from the bottom up, with an edging of lush lace and dense cabling. You can work it in either two colors, in one color, or in one color for the body and cable section, and a second color for the lace. 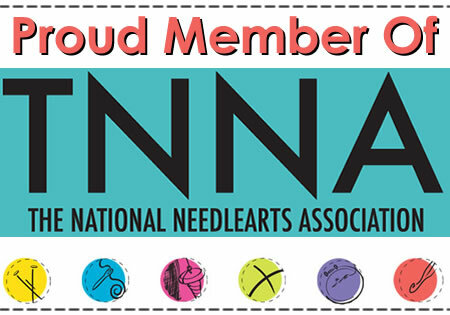 I got to meet Gerty, Anzula's new 100% Targhee yarn, this past summer at TNNA. I'm big fan of American wool, and was thrilled that Anzula was coming out in a breed-specific American wool, milled in the US, in their amazing palette of colors. I decided to do a two-colored cable shawl to explore how Gerty would play with the cables, lace, and colorwork. I chose Clay, a greenish neutral, as the contrast color for the lace and cables, and Teddy, a warm rich brown, as the main color. Escondido Falls Shawl in Clay & Teddy Anzula Gerty. Escondido Falls Shawl in Blueberry Anzula Gerty. The Targhee is extremely bouncy. You can block the heck out of it and it springs back. I initially blocked the two-colored cable shawl to 90¼” / 229 cm along the lace edge to really open up the lace; it now measures 77¼” / 196.5cm, two weeks or so later (the lace edge looks great). 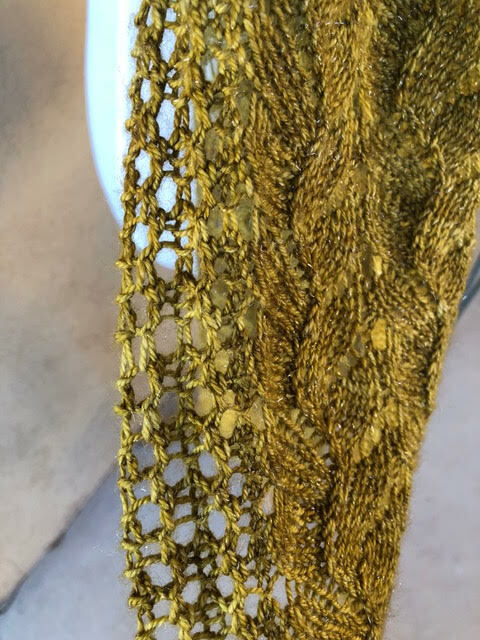 The lace is still perfect even with the spring back of this bouncy yarn. I chose to give this shawl a California place name. I love exploring California parks, and especially waterfall hikes. There are some really neat waterfalls in the Los Angeles area, especially if we’ve had a wet winter, and one of the best is Escondido Falls in Malibu. The pattern is available on Ravelry for $7. Line by line instructions are included for the single color version; the two colored version is charted only. Keep up with all things Stephannie on Ravelry here and on her website sunsetcat.com.